This range of jewellery is hand-crafted by the designer/maker Diane Challenger. The "Designer" range uses silver plate findings with a range of stones and beads, semi-precious stones, Swarovski crystal, biwa pearls and other materials. The range includes earrings, bracelets, necklaces, kilt pin brooches and combination sets. The "Silver" range uses sterling silver chains, beads and findings with more expensive stones and Swarovski crystal and also includes earrings, bracelets, necklaces and combination sets. Each piece is hand-crafted and may vary very slightly from the item pictured. Every piece is packaged in a presentation box or bag. Click on the image to see more detail on each piece. 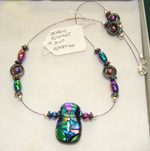 Hand-crafted necklace with dichroic glass pendant and hematine beads.